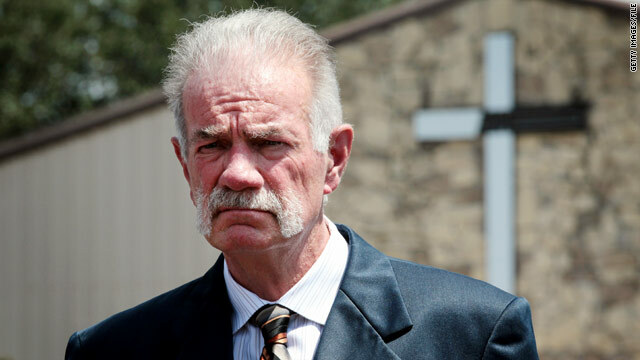 Pastor Terry Jones, head of the 60-member Dove World Outreach Center church near Gainesville, Florida, announces he will host "International Burn a Quran Day" on the eve of the anniversary of the 9/11 attacks. He tells CNN at the time that the event is to protest "the brutality of Islamic law" and that "Islam is of the devil." The event is roundly denounced by a number of groups, including the National Association of Evangelicals. Religious leaders in Gainesville, Florida, hold a peace gathering to show solidarity in their opposition to Jones' planned event. The city of Gainesville denies a burn permit to Dove World Outreach Center, but the church says it still plans to go ahead with the Quran burning. Jones says an armed Christian organization, Right Wing Extreme, will provide security for the church. The organization later pulls its support, saying the event "does not glorify God." Jones signals that he may reconsider the Quran burning after a warning from Gen. David Petraeus, the U.S. commander in Afghanistan, that it could put U.S. forces in danger. The Vatican and others continue to urge the church not to burn Islam's holy book as worldwide protests start to heat up. Meanwhile, the U.S. military prepares for the worst. Days before the planned event, Jones gives mixed messages about whether he intends to carry out his plans: He calls the Quran burning off, then says the church will "rethink our position." As the date approaches, U.S. Defense Secretary Robert Gates and President Barack Obama publicly urge him to call off the event. Jones also announces he plans to travel to New York on the day of the planned burning to meet with the imam behind a proposed Islamic center near ground zero, the site of the 9/11 attacks. On September 11, 2010, Jones tells NBC, "We will definitely not burn the Quran. Not today, not ever." He heads to New York where he sets up a meeting with the imam in charge of the proposed ground zero Islamic center. Speculation that Jones called off the Quran burning as part of a deal to move the proposed Islamic center is disputed by a Florida Muslim leader. Meanwhile, analysts criticize the media coverage of Jones and speculate whether it was all a publicity stunt by a pastor from a small Florida town. A New Jersey dealership gives Jones a free car for calling off the Quran burning. Jones is invited to speak at an English Defense League rally in February 2011, but the British government denies him entry. Jones vows to take legal action. Jones announces he will hold "International Judge the Koran Day" on March 20, in which he stages a mock trial of the Quran, burns the Muslim holy book, and posts photos on his church's website. The incident receives little media attention in the United States, but is publicly condemned by Pakistan's government. The country's interior minister calls for international terrorism charges to be leveled against Jones, according to The Associated Press of Pakistan. Jones says he plans to take part in an April protest at the American Islamic Community Center, in Dearborn, Michigan, outside Detroit. The protest against "Sharia and Jihad" is scheduled for Good Friday, two days before Easter. Officials at the Islamic Center of America are still deciding how to respond, though they are leaning toward a Good Friday counter-event that would bring together religious leaders of different backgrounds to encourage tolerance and interfaith dialogue. Protests break out in Mazar-e Sharif, Afghanistan against the March 20 Quran burning in Florida. A United Nations source says an attack on a U.N. building in the city that left 12 people killed - eight U.N. workers and four Afghans - followed those protests. This paragraph is in fact a fastidious one it helps new web people, who are wishing in favor of blogging. 3Jdesigner's stock account Todd BratrudBrowse a trying amongst parts in long time skate board enterprise Todd Bratrud fabric handbags. LAST DAY..............numbers ...........can you figure them out ?...............the fairy in the sky did not create US ! See for yourself below.................the sign in picture above is wrong !! !........The fairy in the sky did NOT create us !! !